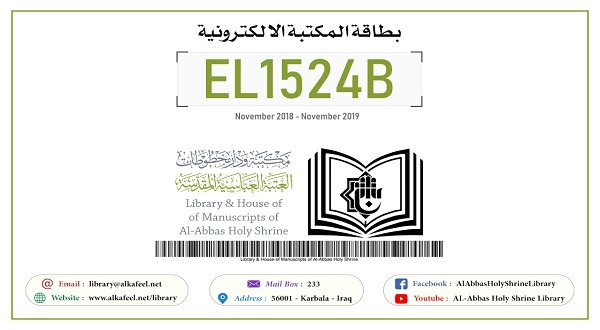 In appreciation of the work done by the researchers who wish to reach sources for their research projects, and in order to increase the interest and keep pace with the developments in the field of the library, the Library and House of Manuscripts of the al-Abbas's (p) holy shrine has launched the electronic card service to benefit from the books of this library. The administration of the library has shown that this service is free of charge, enabling the researchers to reach the electronic resources available in the library and House of Manuscripts at the al-Abbas's (p) holy shrine. The required electronic source is sent to the beneficiary's e-mail by filling the information in the attached form at the following link: https://goo.gl/forms/HPhXH2NX1eUB6jWG3 , where the name and image associated with the Google Account will be registered upon uploading and sending files to this form. Copy of the functional identity of the beneficiary from the institution to which he belongs and in force. The code mentioned in the identity of the e-library if you have previously benefited from the service, to go beyond filling out the form again. Fourth: After completing the form, click the submit button to complete the application. First, you can request only one source every 15 days. Second: You can request only two sources every 10 days if you provide us with an important facilitation letter from your institution (in addition to the functional identity) addressed to the library of the al-Abbas's (p) Holy Shrine, mentioning the name of the beneficiary and its title including the expression "To benefit from the e-service" and the letter must be signed and sealed with the official seal of the institution. Thirdly, taking into consideration intellectual property rights by quoting the source.